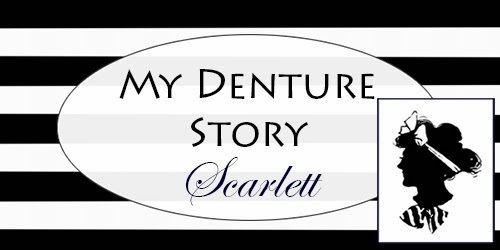 Scarlett’s Denture Story | iweardentures! I’m an Animal Care Techinician working in the companion animal healthcare industry. I have a wonderful boyfriend and a little rescue dog. I remember going to the dentist as a kid; mainly bad experiences (for both my sister and I) as the dentist, though specializing in pediatric dentistry, was not kind, compassionate or attentive to the needs of his patients. At one point during an extraction when my sister (around age 7 at this time) told them she was not completely numb, he screamed at her (audible into the waiting area) and then stabbed her quite hard with the lidocaine needle. She began screaming, at which point my mom ran into the room to comfort her, and other patients left the office with their children altogether. In a separate incident, one of the dental assistants (preparing for one of my sister’s extractions) numbed the wrong side of her mouth. Thank goodness my sister spoke up as the dentist was beginning! My wisdom teeth came completely in before I was 16 years old and began crowding, causing breakage and a slow overlap of my two front teeth. The first hole I had in a tooth was when I was 15, caused by chewing on a pen cap in class. Since that time, though I take good care of my teeth, things have gotten progressively worse. I had not seen a regular dentist in 12 years.Last week I had enough and after FINALLY getting decent dental coverage to where I can actually afford to have the work done that I need, I made an appointment for a comprehensive exam and treatment plan. As of right now, root canals are too expensive for me to afford as I would need 7 of them. I’m still considering my options, but since RTC’s are off the table, I need 11 extractions… all my molars, which will be replaced by flexible upper & lower partials. Only one affected tooth is barely visible in my smile line, and it has already broken off at the gumline so it’s not a huge loss to me. Most of my front teeth and bicuspids need fillings and a couple are fine, but all the rest have to go due to their various states of decay. I can’t say I wasn’t expecting it, but I didn’t have any choice except to wait until I could afford it. I did a provider search with my current insurance company and then read the reviews online and on Facebook, in addition to the “smile makeovers” they posted from their clients in my area. Affordability and financing were secondary options since I knew the cost would be extensive even with insurance. I will likely opt for extractions of the diseased teeth only, fillings for the ones that need them, and flexible upper and lower partials to replace my molars. My parents told me as a kid that if I didn’t brush my teeth I’d end up having all my teeth taken out and having to get dentures / never smile again / be ugly / look old. It was a thing of shame in my family. And yet, my parents didn’t believe in regular dental cleanings and care, or the prescription toothpaste I needed to ensure I had the healthy adult teeth I could have had today. Have those feelings changed? If so, how? The more research I do, the more I see this as replacing the functional teeth I could have. As it currently stands, I cannot chew properly, eat nuts, granola (my favorite). I can’t chew chips or crunchy things, EVERYTHING gets stuck in my teeth, and I haven’t taken a bite out of an apple since 2009 when I broke one of my teeth by doing so. There is a constant fight against plaque building up in and on the damaged teeth, and keeping my breath fresh (a bigger deal to me than the chewing). Daily flossing is maddening and painful. Even though I’ll have to “relearn” how to chew… once I relearn it, I’ll actually be able to do it. What a small but essential accomplishment! I’m afraid of the bone loss that will occur with time. I’m 26, about to get engaged (we picked out the ring!) and children are in our eventual future. I understand there is a toll taken on teeth and bone during pregnancy in addition to normal aging. I don’t want to need bone grafts to support dental implants should that become a necessity in the future. Also, where will my state of bone loss be in 20 years… 30 years… 40 years? My boyfriend is incredibly supportive. My dad thinks it’s ridiculous that dentistry costs this much and nothing else can be done. I’m sure he’ll ‘support’ me though. My sister is supportive but completely terrified by dentistry in general and prefers not to listen to my gross extraction stories. Brush twice per day with Sensodyne Pronamel, rinse twice per day with Sensodyne Pronamel mouthwash, floss nightly. I also rinse my mouth out regularly after I eat. Please share any other thoughts or relevant information you may have. Does anyone have flexible partials for their molars only? How do they fit? Do the bottoms move around in your mouth a lot? The last thing I want to do is something permanent that I’ll hate! I am in the midst of having extensive dental work done which includes several implants. My dentist wanted to make sure I had a decent bite during all if not most of the process. I have been using an upper partial to protect one of the implant sites and support the temporary bridge and a lower partial for both sides covering missing molars. Dental explanations can be a bit confusing since not all dentists use the same exact terminology. You mentioned flexible partials and that may be what I have been using but my dentist does not call them that. Mine are are acrylic but the clasps are metal. I am going to be given a permanent set to wear for the lower within the next month. I am assuming it will be sturdier. I have been told that one should not have to use adhesive with partials but I found that mine moved too much and lifted enough to cause issues. Food would become trapped under the partial and cause pain. I believe there may be movement with any type of partial. If this is your only option (aside from no teeth) than be aware of the difficulties you may encounter and seek out solutions to make dealing with partials easier. My dentist claims I am doing remarkably well with them but I know as time as gone on I find myself wearing them less. This is not a good thing as I am putting pressure on the remaining teeth that I wish too save. I am hoping that the new permanent partials will be more comfortable. The positive aspect is that when I use the adhesive I have a solid bite which puts the joy back in eating. One thing I can not stress enough is that if you have any discomfort from the partials do not hesitate to contact your dentist. Mine needed adjustments several times. Each adjustment was minor and make a major difference. Being able to chew properly is well worth the bit of aggravation the partials have caused me. however once you ought to choose one methodology, you're thinking that concerning the value, the potency of that methodology, and also the potential risks which may occur. during this case, it's best to consult knowledgeable in oral health so as to allow you customized recommendations, for more information click here veneers royal palm beach. Are you long-lasting verified income? If you occur to answered certainly to help you each of those problems you may definitely be entitled to having having getting some type of Technique Home fund cost-effective cost-effective economical loan using US ALL Payday improve payday improve enhance payday loans direct lender chicago developments improvements. Purple Payday Economical loans evaluation stocks the three main company for your loans and these are CashNet USA, Rapid Money and Check Into Money. Each of these suppliers can lend you a different set bad credit payday loans corona of maximum possible quantity to financial loan. I am 41 yr old female and have had full dentures for 4 yrs. Unfortunately, they were poorly made, my bottoms don't fit, I can't chew properly, actually, just as the above person mentioned, I can't eat ANY of my fav foods.. Granola, an apple, salads.. Nothing crunchy or chewy.. and can't afford new ones. I only have dentures because I had teeth issues I was unaware of until it was to late and all of my teeth were being extracted by a butcher!!! I had beautiful teeth since my braces at age 15. Things started to go arye when I needed a root canal on my 2 front teeth and they didn't put a post so they became loose and they didn't support the rest of my teeth. I had something called "dry mouth" that my dentist never made me aware of and it rotted my teeth from the inside out and they never told me until I needed them pulled… ONE AT A TIME! Now, my bone on my bottom jaw is to small as someone mentioned above to fit my lower denture.. I need a bone implant which I can't afford. I refuse to tell anyone, I won't date, I can't get super intimate with anyone in fear they will know I'm wearing dentures… How awful. I'm.ashamed and embarrassed. I've contemplated suicide many times. I can't eat normal.. I have chronic IBS a and migraines and it makes it so much worse. I pray one day I'll be able to get new ones that stay in place or are implanted into my gums. It is vital for somebody to know the things that ought to be done keeping in mind the end goal to decide if a general temporary worker is an expert or not. Be that as it may, there are still many people who don’t know about these things, which is the reason they regularly wind up employing the wrong temporary worker for them. This article will disclose to you a portion of the things that you have to know and the things that you have to do with a specific end goal to make sure that you will dependably locate an expert general temporary worker. This will spare you from every one of the issues that you may experience when managing beginners.